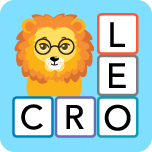 Leo Crosswords has been carefully designed to introduce young learners to Spanish, with a focus on vocabulary and pronunciation. The program enables students to learn new words that contain Open Syllables (ends in a vowel) or Mixed Syllables (ends in a vowel or a consonant). In addition, students can focus on more challenging words that are Blends (combinations of 2 or 3 consonants such as "bl" or "ch") and Digraphs (vowel combinations that have distinct sounds like "au" and "eu"). By breaking words down in syllables, students begin to discover patterns which makes learning new words easier.